Watch: Olympic gymnast Louis Smith spearheads TheLADbible's mental health campaign U OK M8? Four-times Olympic medal winner Louis Smith is spearheading a new campaign from TheLADbible in its efforts to raise awareness of male mental health issues. The online news and entertainment community wants to develop understanding of mental health issues and suicide risk in the UK. It has linked up with a range of charities for the U OK M8? campaign, which will run across a variety of media platforms. Partners include Samaritans, the Campign Against Living Miserably, the Movember Foundation and the Mental Health Foundation. TheLADbible hopes to draw on its large youth audience over the next three months to get men to open up to each other about depression and suicide. In a video to launch the campaign, Smith discusses his own experiences of depression after the Beijing Olympics. "I was snatched away from my old life so quick, I got that down I could see why people would end up committing suicide. I think men try to be proud, almost to the point that they try to be in denial. And if anything goes wrong, it just boils over," the 2012 and 2016 Olympic silver medallist said. Other video content created for the campaign includes a film about Andy’s Man Club, a group for men based in Halifax. The film series will be supported by a series of editorial pieces and content across Instagram, Facebook, Snapchat, YouTube and Twitter to drive conversation about the issues, in addition to a dedicated U OK M8? hub integrated into theladbible.com website. 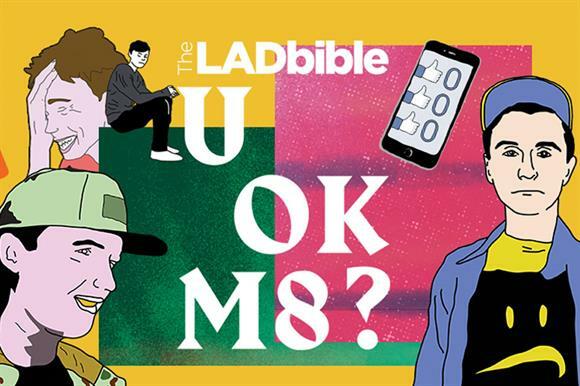 Ian Moore, editorial director at TheLADbible, said the aim was to generate "more data-driven insight into male mental health than has ever been achieved before". He added: "We know that our audience is hugely affected by these issues and they need to feel that opening up is the brave thing to do. "By opening up our platform so our audience can talk about these issues, we can persuade young men to give themselves permission to talk about the feelings of isolation, anxiety and depression that they currently keep secret." Mark Rowland, director of the Mental Health Foundation, said the campaign had the potential to provide information hitherto unknown. "We know there’s a crisis in men’s mental health – the suicide statistics alone tell us this," he said. "What we need and what we hope this campaign can achieve, is to shatter the silence around this topic. "This ambitious campaign from TheLADbible has the potential to give us insights into one of the defining issues of our time on a scale not seen before."